What can you do with a screenful of teletext? Some answers are found in this look at design examples past and present. 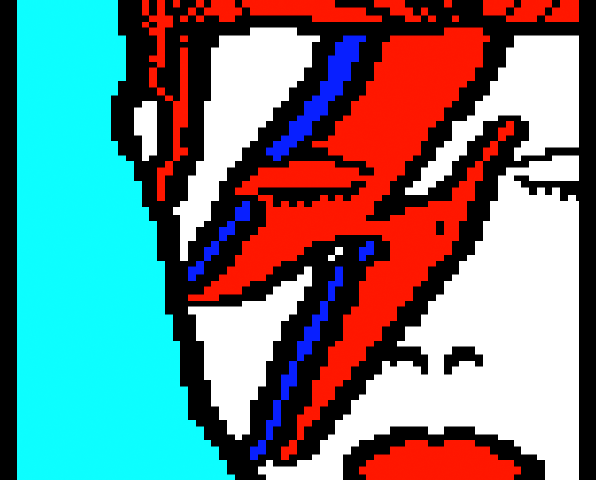 The deceptively simple teletext canvas accommodates an almost endless variety of art. The graphics pixels in teletext are grouped into sets of six. Each mosaic of 'sixels' takes up one letter's worth of space. Sometimes the mosaics are displayed in a separated fashion. There are invisible codes to change colour or separation that also take up a character cell each, often leaving a blank space in the design. These peculiarities may seem like frustrating limitations but they deliver amazing graphic designs to screens using just a tiny vocabulary of digital codes. 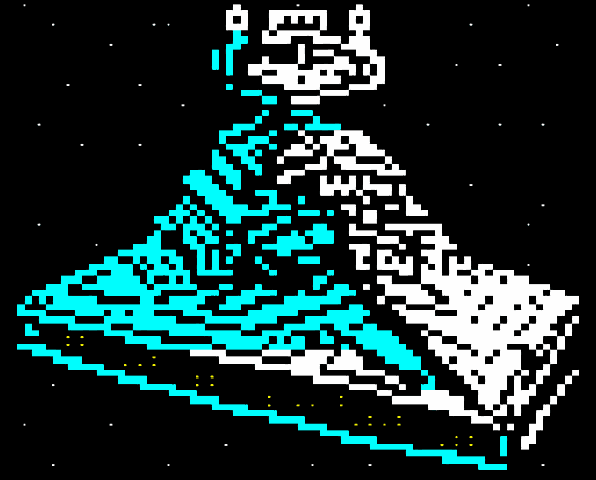 Teletext was a true breakthrough at its conception and it remains a distinctive art style today. 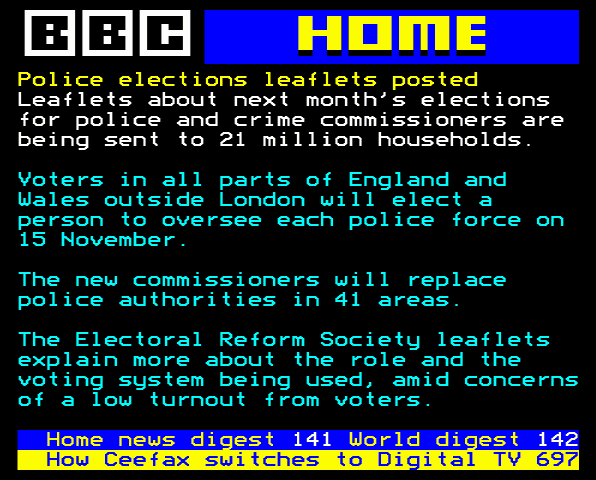 The most common teletext graphics form highly visible page headers above text content, particularly in news stories and list tables, as shown in the images above. 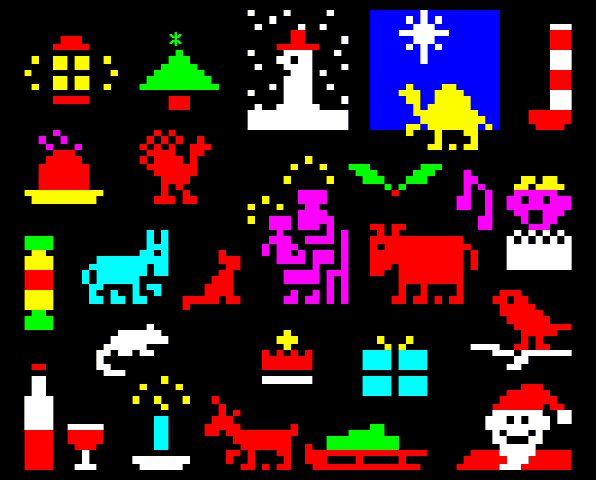 The vast majority of teletext is variations on these two designs. 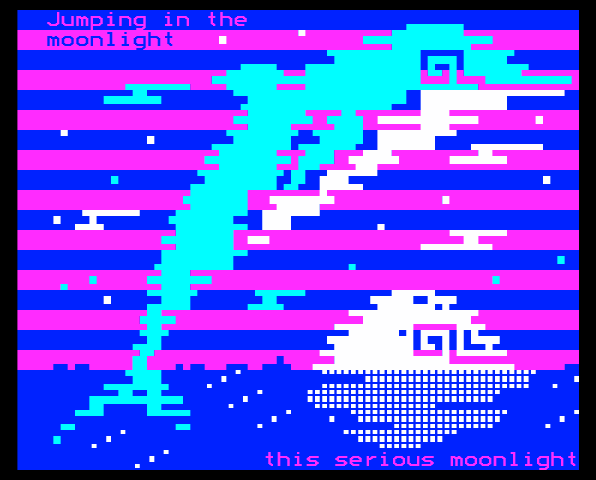 Occasionally teletext designs will include 'spot illos,' miniature illustrations amid the page's body text. Mr Biffo uses these often, as seen in one of his recent gag adverts below. Then come larger elements like infographics, where text can become a minority element of the display. The classic example is a broadcaster's weather map, although the one above is a pisstake from The Day Today. The 'Weather News' sun is a well-remembered design from Mort Smith of the Ceefax team. It's primarily separated graphics using 'negative space' – the space amid the coloured regions defines the artwork. Here too, black spaces make allowance for invisible codes permitting the mosaics to change from one colour to the next along each row. 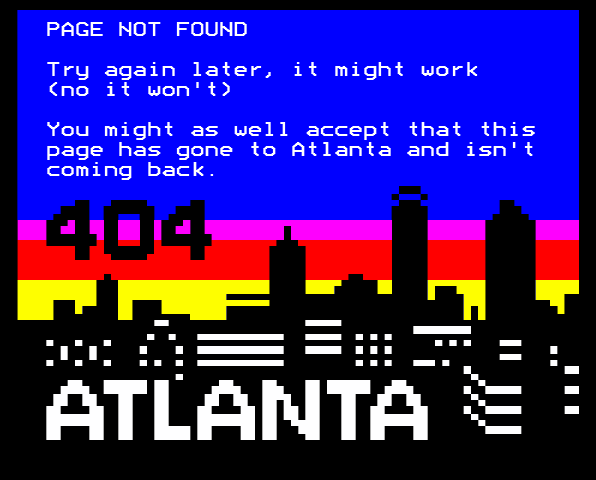 The error page above from the Teefax teletext service takes advantage of the striped nature of background colour. At points where the sky mingles with shapes, the illustration reverts to coloured mosaics over black. The artwork above right by Andy Jenkinson uses a similar trick, 'code shadows.' This sneaks codes into areas that the eye expects to be dark anyway. Below, Dan Farrimond has tightly wrapped colour around codes but in a different style. By alternating mosaic colour each row, he's created an illusion of background colour stripes. The next pic, above, is representative of the art book Thread of Fate by Raquel Meyers. For effect, the palette over black is limited to one or two colours and the image subjects are rendered in an angular style independent of the teletext pixels. One last trick, above right, is another one from Horsenburger (Steve Horsley). For the tiny points of light he's used text mode full stops and colons amid the sixels. 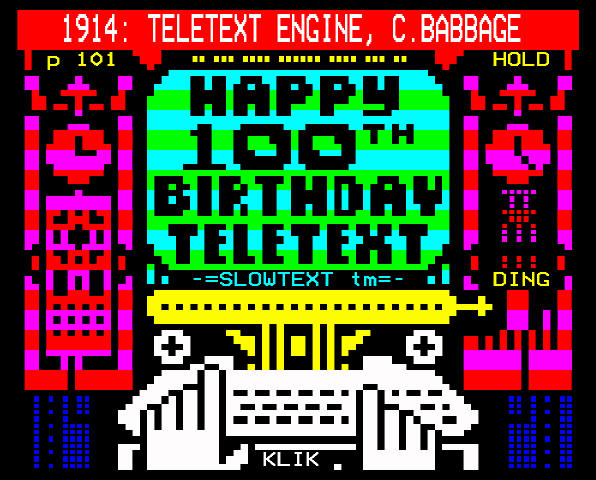 Images of teletext are constantly shared online as teletextrs exchange pages past and present. Sometimes an editor link will be included for others to mashup or simply to show the artist's working. These links can be quite long so URL shorteners like goo.gl are recommended. When you export an image from a teletext editor, it might look too narrow. Such raw content isn't really created to be looked at. Editors and televisions display that content a bit wider. Forgetting the subpage index for a moment, note that the art above is only 23 rows high. 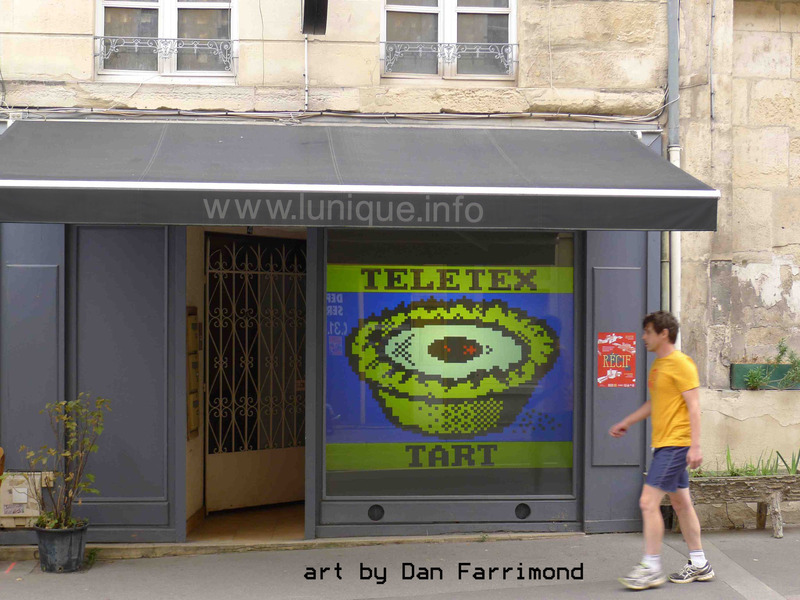 Teletext services like ARDText and Teefax use rows 0 and 24 for things like the date and 'fastext links' which correspond to multi-coloured remote control buttons. Because teletext services are good showcases for art, 23 rows is a good maximum height to stick to. Consequently, it may be practical to crop a bit off the top and bottom of your widened exports. If your art would look strange with its content sitting against the edges of the image, it may be worth leaving 10px or so of margins all round. Sometimes, artists may simply choose not to adhere to these guidelines. For example, the last row can occasionally accommodate artwork if the teletext service agrees to forgo fastext for one page. In other cases it might be valuable for historians and others to preserve lines 0 and 24 of broadcast teletext. All 25 lines might also make sense for a screen shot in some documentation. Inspired? Why not have a go yourself? Check out the How-To Guide PDF for Edit-TF, whose concepts also apply to ZX Editor, wxTED and other teletext editors. I got my start in pixel art making graphics for VHS films on Commodore and Atari computers. 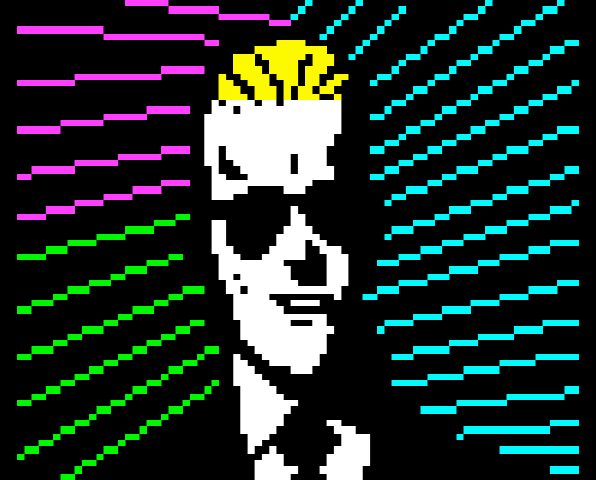 Having later moved on to Adobe programs and such, I've recently been back in an 80's style doing teletext. Further reading: Teletext Lives, an introduction and Teletext Future, some thoughts on what's next. Text is primary sourced. 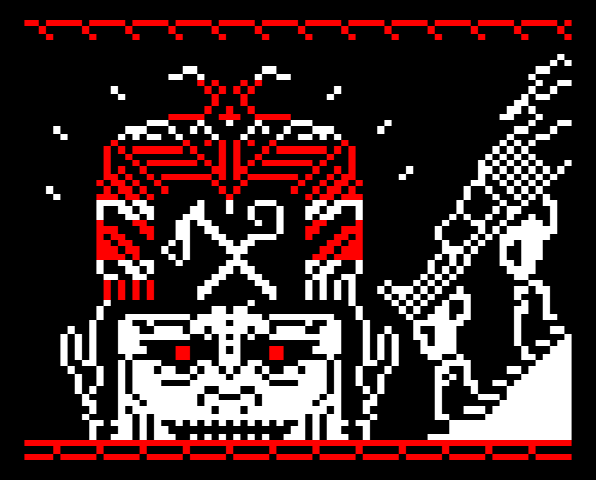 The jargon 'code borders' and 'code shadows' and assertions like 'the vast majority of teletext is variations on these two designs' originate from my own experience of teletext live and archived. HDTV width of 680px is own work, calculated from aluminium tape measurements of live teletext on a Samsung D5520 high definition television. Level 2 features are not covered here as tools to create them are not yet democratised. The presence of side panels, for example, would increase all width measurements above.